Make a Masterpiece Match: Calling all super sleuths! 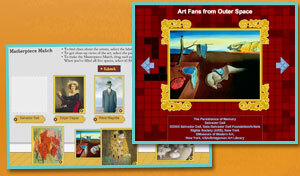 Use clues to link paintings to the artists behind them. Can you crack the code? Follow the clues to unlock a secret message. Can you fit the pentomino pieces together to form a solid rectangle? There are thousands of ways to complete the puzzle. For practice, give it a try with these printable pentominoes [PDF]. Piece together words and images to post real-time messages for fellow Blue Balliett fans. When Calder has a question, he turns to his pentomino pieces to reveal the answer. Think of a question and see where the pentominoes lead you.